SORCE » The SORCE Mission Celebrates Ten Years! This image shows the SORCE spacecraft with the solar arrays deployed during integration and testing at Orbital Sciences Corporation. Image credit: Orbital Sciences Corporation. "As there is only one object in the sky on whom we utterly depend, there can be no astronomical question of more practical significance to mankind than that of the Sun’s variability. To determine whether the solar constant is varying…requires long-term monitoring of both the bulk solar radiation and its terrestrially important spectral components. This assignment is not an easy one, for it demands a capability of sensing changes of no more than 0.1% in a decade, carried out over many decades. In the real world of science the greater challenge may be that of insuring the continuance of such a program." The Sun is the solar system’s “furnace.” Solar radiation carries energy to Earth and beyond, fueling planets and driving a myriad of radiative, chemical, and dynamical processes in Earth’s environment that influence natural climate variability. Light at visible wavelengths carries most of the Sun’s energy to Earth (82% of the total energy comes from visible wavelengths from 390 to 750 nm). On average only about 50% of the solar radiation directly reaches the surface due to reflection and attenuation by the overlying atmosphere. Variations in solar irradiance occur on all time scales—from seconds to centuries and longer—and can only be accurately measured from space-based platforms. 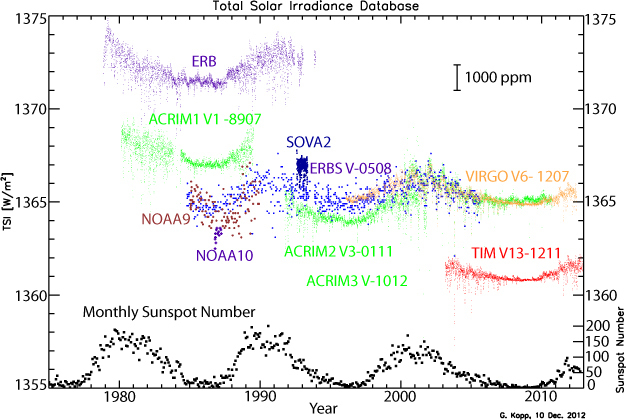 Decades-long attempts to measure the total solar irradiance (TSI ) from the ground and rockets have failed to detect the true variability: Historic satellite measurements of TSI and ultraviolet (UV) solar spectral irradiance (SSI) date back to 1978—see Figure 1. 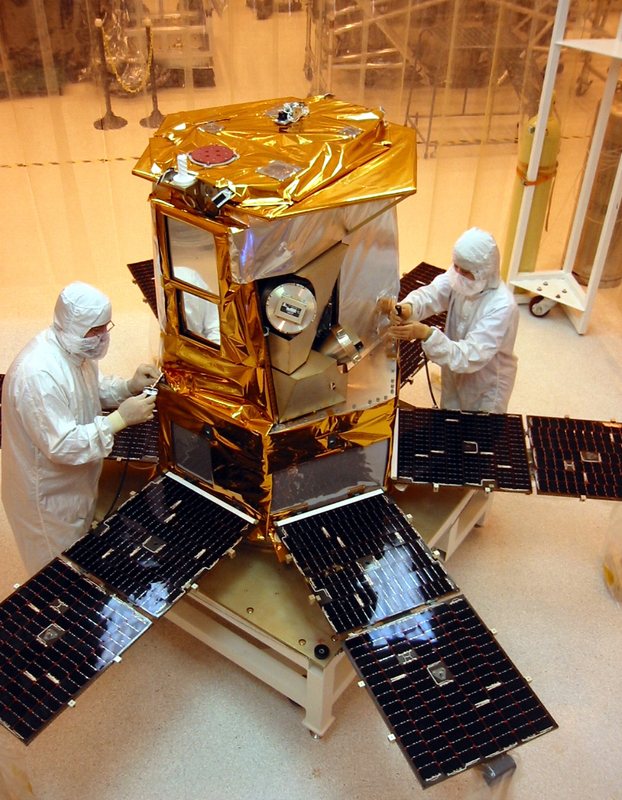 On January 25, 2003, NASA’s Solar Radiation and Climate Experiment (SORCE) spacecraft was launched into space on a Pegasus XL launch vehicle that carried four instruments: the Total Irradiance Monitor (TIM), Solar Stellar Irradiance Comparison Experiment (SOLSTICE), Spectral Irradiance Monitor (SIM), and Extreme Ultraviolet Photometer System (XPS). The primary objective for SORCE is to measure important solar input to Earth’s radiation budget and to relate how solar variability influences our atmosphere and climate. 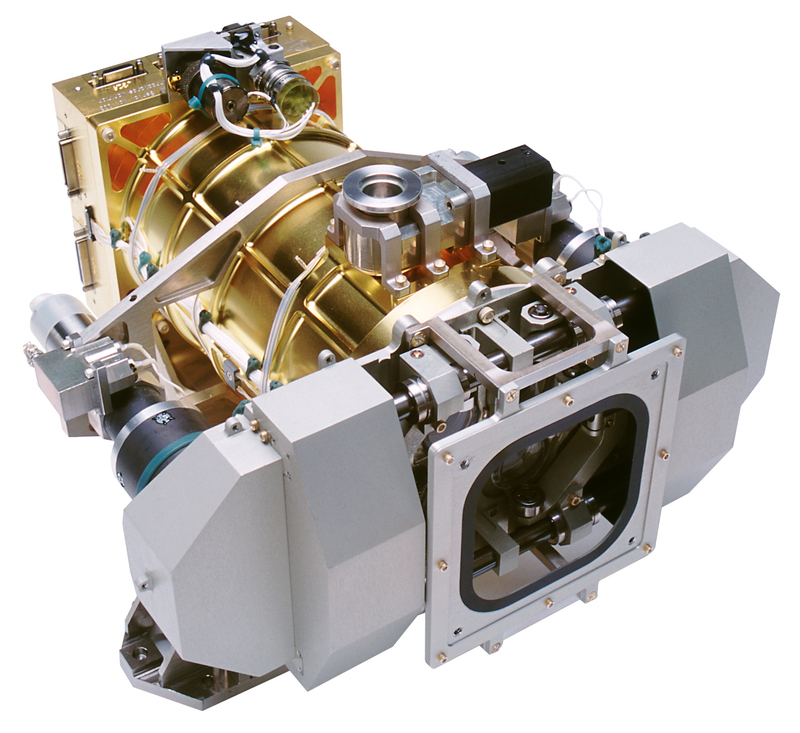 SORCE continues the precise measurement of TSI that began with the Earth Radiation Budget (ERB) instrument onboard the Nimbus-7 satellite in 1978 and has also continued to present with the Active Cavity Radiometer Irradiance Monitor (ACRIM) series of measurements. To learn the history of how SORCE came to be, see The History of SORCE section in this article. Ten years of observations from SORCE’s TIM and SOLSTICE instruments have extended the critical Sun-climate records of TSI and UV SSI measurements. SORCE’s SIM instrument made the first continuous space-based observations of SSI at visible and infrared (IR) wavelengths, forming the basis for a new climatological record of the visible and IR SSI. SIM was designed for continuous spectral measurements through the near UV, visible, and near IR with the stability needed to determine, for the first time, true changes in SSI in these wavelengths. The XPS instrument measures high-energy UV radiation and lower energy X-ray wavelengths. These measurements yield valuable information about the Sun’s corona, solar events that impact satellite communications, and the Sun’s effects on the very outermost layers of Earth’s atmosphere. Figure 1. 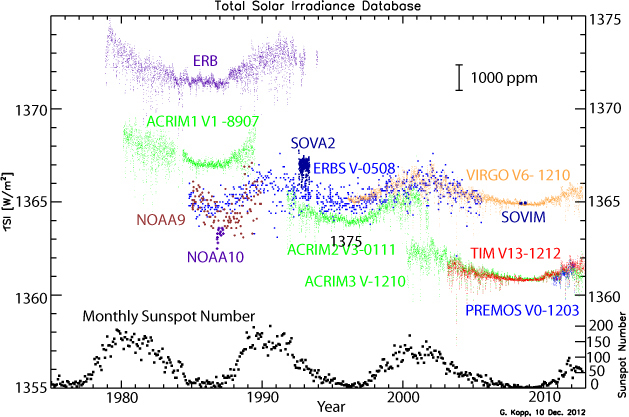 This timeline shows various milestones in the development of solar irradiance measurements relevant to the SORCE mission. Image credit: LASP / NASA. 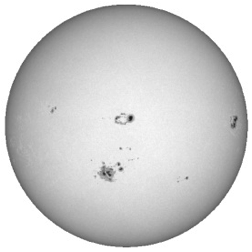 The largest sunspots in 50 years appeared in October 2003. Image credit: Solar and Heliospheric Observatory-Michelson Doppler Imager. In early 1988 NASA issued an Announcement of Opportunity (AO) for the Earth Observing System (EOS), seeking proposals to fly instruments onboard a polar-orbiting platform, known as EOS-A, to study Earth’s systems from space. At that time, the University of Colorado’s Laboratory for Atmospheric and Space Physics (LASP) was operating the Solar Mesosphere Explorer (SME), which was launched in 1981. In addition to atmospheric ozone experiments, SME carried a solar irradiance spectrometer to collect data between 115 and 300 nm. LASP had also completed the design and fabrication of the Solar Stellar Irradiance Comparison Experiment (SOLSTICE). SOLSTICE was in its calibration phase and awaited integration to launch onboard NASA’s Upper Atmosphere Research Satellite (UARS) in 1991. It was quite appropriate and natural that LASP responded to the EOS AO with a proposal to provide a second generation SOLSTICE (EOS SOLSTICE) to fly on the polar-orbiting platform. NASA received 458 proposals in response to the EOS AO, and EOS SOLSTICE was one of the 30 Instrument Investigations selected. The NASA selection specified that SOLSTICE would become a Flight of Opportunity (FOO) and NASA’s Goddard Space Flight Center would be responsible for finding the appropriate opportunity. The search became an (almost) endless process, with all possible large and small, national and international, high- and low-risk missions considered, until 1998 when the small, free-flying SORCE mission begin to materialize. The original NASA selection process and restructuring of the EOS program determined the future of the SORCE mission. After launch in 1991 it became apparent that the UARS SOLSTICE technique of comparing the Sun to bright, blue stars worked very well—at the 1% accuracy level. This level of accuracy was more than adequate to determine solar variability at wavelengths below 240 nm and acceptable out to 300 nm, but provided only an upper limit at longer wavelengths. The EOS SOLSTICE needed to push this accuracy limit, so LASP developed an entirely new optical channel with a single figured prism and a miniature electrical substitution radiometer (ESR). The electronics of the new ESR were game changing, although somewhat similar to those of previous radiometers. ESR incorporated a revolutionary phase sensitive detection. This new channel became a separate instrument on SORCE— the Solar Irradiance Monitor (SIM). Another of the 30 EOS instruments selected in 1989 was the Active Cavity Radiometer Irradiance Monitor (ACRIM) that would measure TSI. This instrument was also relegated to the FOO category, but—unlike SOLSTICE—it fast-tracked as a small free-flyer named ACRIMSAT, and was launched in 1999. ACRIMSAT was the first of three, five-year TSI missions. To procure the second and third missions, NASA issued an AO in 1997 for a Total Solar Irradiance Monitor (TSIM). LASP was confident in its ongoing development of the ESR for SIM, and felt the phase-sensitive detection approach would provide a far-more-accurate TSI device. LASP proposed for TSIM, and was selected in 1999. Meanwhile, throughout the 1990s the LASP extreme UV (EUV) irradiance program was becoming extremely robust. A highly successful sounding rocket program at LASP, and the Student Nitric Oxide Explorer (SNOE) and Thermosphere Ionosphere Mesosphere Energetics and Dynamics (TIMED) missions had developed exceptional EUV photometers. An outgrowth of these programs, the X-ray Photometer System (XPS) was developed and added to the planned EOS SOLSTICE mission. By the late 1990s EOS SOLSTICE was being studied as a possible free-flyer; the recently awarded TSIM was also considered a free-flyer. It made sense to combine the two missions into what became the SORCE mission. 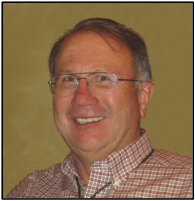 SORCE would combine the instruments planned for SOLSTICE and TSIM on a single platform, and operate as a principal investigator (PI)-led program with LASP as the lead institution and Dr. Gary Rottman as the SORCE PI. LASP selected Orbital Sciences Corporation (OSC) to build the spacecraft. Since launch the entire program has been on schedule. SORCE was under budget, so in 2008 the University of Colorado returned $2,997,000 to NASA after successfully completing its prime mission. SORCE’s state-of-the-art solar radiometers (i.e., SOLSTICE, TIM, SIM, and XPS) have successfully characterized simultaneous changes in TSI and SSI that occur in concert with the Sun’s ever-changing activity. The SORCE mission began near the peak of activity in Solar Cycle 23 and captured solar irradiance changes during one of the largest solar eruptions ever witnessed—nicknamed the “Halloween Storm”—in October 2003. In addition to observing a 4-W/m2 TSI decrease from October 18-29, and measuring the accompanying spectral changes, SORCE’s TIM recorded the first direct measurement of a solar flare in TSI that increased by 0.2 W/m2 for approximately 10 minutes on October 28. During its ten-year mission, SORCE monitored solar irradiance continuously during the decline of solar activity into the prolonged, anomalously quiet minimum that began in 2008. Combining SOLSTICE and SIM spectral measurements during this period, along with those at shorter EUV wavelengths made by SORCE’s XPS and the Thermosphere Ionosphere Mesosphere Energetics and Dynamics (TIMED) mission’s Solar EUV Experiment (SEE), produced the most accurate reference spectrum of solar irradiance for the nominally inactive “quiet” Sun. This reference spectrum—shown in Figure 2—is a unique benchmark and reference for past and future solar variability. Solar activity has now begun to increase again with the onset of a new solar cycle (Solar Cycle 24), and SORCE continues to track the solar irradiance fluctuations that are expected to peak in 2013 at a modest level. Solar Cycle 24 is exhibiting notable differences from the three prior, more active cycles for which TSI and ultraviolet SSI observations exist—and SORCE will be there to observe it as it evolves. Figure 2. This figure represents a synopsis of the primary studies with SORCE data. The SORCE total and spectral radiometers measure daily the spectrum of the Sun and its variability. Solar energy establishes the structure of Earth’s atmosphere through a series of key chemical reactions and thermodynamic processes. The SORCE instruments were designed to provide input for studying different layers of Earth’s atmosphere and influences on climate change. Image credit: LASP. Results from the SORCE mission show that solar irradiance varies continuously at all wavelengths across the electromagnetic spectrum. The changes are tightly connected to solar activity, which generates both dark and bright magnetic features (sunspots and faculae respectively) on the Sun’s disk. These features alter the local emissions from the Sun’s surface in different ways and at different wavelengths, depending on where the emissions originate within the Sun’s atmosphere. Solar irradiance changes continuously as these magnetic features appear, evolve, and decay, while the Sun’s rotation alters their location on the disk seen from Earth. SORCE’s measurements have characterized these changes in TSI and SSI on time scales from minutes to years. Clarifying the spectral contributions to the total irradiance variation on longer time scales of the solar cycle is underway, taking into account the wavelength-dependent changes in instrument sensitivity that are ubiquitous in space-based observations, which SORCE’s instruments monitor via redundant optical channels and periodic observations of stars. As the ability to model Earth’s climate and atmosphere has advanced, so too has the need for improved specification of solar irradiance inputs—as illustrated in Figure 2. Most, if not all, state-of-the-art models of Earth’s climate and atmosphere, such as those used for the Intergovernmental Panel on Climate Change’s Fifth Assessment Report (IPCC AR5) and the Ozone Assessment, now require the SSI—not just the total (spectrally integrated) quantity. Analysis of SORCE spectral irradiance observations and development and validation of models of spectral irradiance variability for use in global change studies is a key science objective of SORCE. Even as the SORCE instruments have reliably and routinely tracked the Sun’s irradiance, they have also recorded exciting serendipitous phenomena, detecting signatures as both Venus and Mercury transited the disk of the Sun, which each occurred twice during the mission. Additionally, the fundamental metrological scale that the SORCE instruments carried into space, traceable through careful characterization and accurate calibration to National Institutes of Standards and Technology (NIST) standards, is being transferred to other astronomical objects—e.g., stars and the Moon. The SORCE science team compiled a list of mission results. While cognizant of the fact that there are many other results and details that could have been included, the consensus among the team members was that these ten are among the most noteworthy achievements from SORCE’s first decade in orbit. The remainder of this article describes SORCE’s key results, which are summarized in the "Top 10" list below. Established a new level of TSI that is 4.6 W/m2 (0.34%) lower than prior space-based observations. Acquired the first continuous measurements of SSI in the 115- to 2400-nm spectral range. Defined an accurate reference spectrum of the Sun’s spectral irradiance from 0.1 to 2400 nm during very quiet solar conditions. Provided total and spectral irradiance inputs to the climate and atmospheric communities, and used in a wide variety of simulations and models. Implemented next-generation instrumentation of spaceflight radiometers for solar irradiance monitoring with the highest accuracy and precision yet achieved. Seamlessly extended the National Oceanic and Atmospheric Administration’s (NOAA’s) Mg II index of chromospheric activity. Acquired the first solar flare measurements in TSI, and accompanying spectral variations. 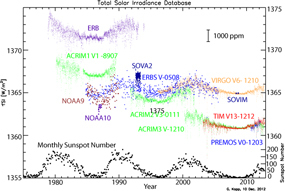 Advanced and validated models of the Sun’s total and spectral irradiance variability. Observed two Venus transits and two Mercury transits of the Sun, demonstrating exo-solar planet detection capabilities and limitations. Validated the white dwarf flux scale for absolute calibration of instruments for UV astronomy and made the first absolute measurement of disk integrated lunar UV reflectance. For more information about how TIM observed the 2012 transit of Venus, read SORCE/TIM Views the 2012 Transit of Venus in the July-August 2012 issue of The Earth Observer [Volume 24, Issue 4, pp. 36-37]. SORCE’s Total Irradiance Monitor (TIM). The SORCE TIM extends the uninterrupted spaceborne measurements of TSI that began in 1978. Offsets between prior measurements due to instrument calibration differences have made construction of a single composite record difficult, and overlapping instruments to provide measurement continuity is imperative. The advanced design and laboratory calibrations ofTIM give it an estimated uncertainty of 0.035%—more than a factor of three improvement relative to prior instruments. By virtue of its unique design and resulting accuracy, the TIM established a new baseline TSI level of the net radiative solar energy at Earth’s top of the atmosphere (TOA) of 1360.8 W/m2 –0.34% (4.6 W/m2) lower than previously measured—during the recent solar minimum [Kopp and Lean, 2011].This improved absolute accuracy reduces risk from a potential loss in continuity of the solar data record; although detection of solar trends at the levels needed for climate studies will continue to rely on TSI measurement overlap until uncertainties are reduced further. TIM’s innovative new optical design is the primary reason for its improved measurement accuracy, verified by comparisons of a ground-based TIM with international facilities at NIST and the Physikalisch-Meteorologisches Observatorium Davos (PMOD) World Radiometric Reference, as well as at LASP’s newly created TSI Radiometer Facility (TRF). All prior spaceborne TSI instruments were of a configuration that was much more susceptible to internal scattered light, which caused erroneously high measurements. TRF comparisons with previous instruments help quantify the scatter in their datasets and establish the needed corrections to their measurements. Contemporaneous measurements now report TSI values that are very similar to those that TIM first released soon after SORCE’s launch. Figure 3 shows the 34-year long TSI record and the improved measurement agreement with the currently operating instruments. Figure 3. Having lower uncertainties than other flight TSI instruments, the TIM established a new, lower TSI value of 1360.8 W/m2. Recently applied corrections for scatter—which causes erroneously high readings in other instruments—have lowered those instruments’ values, and the agreement between TSI measurements is now much improved. Image credit: LASP. SORCE’s Spectral Irradiance Monitor (SIM). SORCE’s SOLSTICE and SIM have measured SSI during most of a solar cycle, and across most wavelengths. SIM also employs an innovative optical design, based on a Fèry prism spectrometer that both focuses and disperses light onto multiple detectors with only one optical element. The primary detector for SIM is a newly designed miniature electrical substitution radiometer (ESR)—see The History of SORCE sidebar —similar in concept to TIM’s radiometer. Three additional photodiode detectors complement the ESR and provide a higher signal-to-noise ratio and faster response. On-orbit degradation of these detectors is corrected using the highly stable ESR. Comparisons of solar spectral irradiance measurements made by two identical (i.e., mirror-image) spectrometers, each with different solar exposure rates, establishes the prism’s on-orbit degradation. 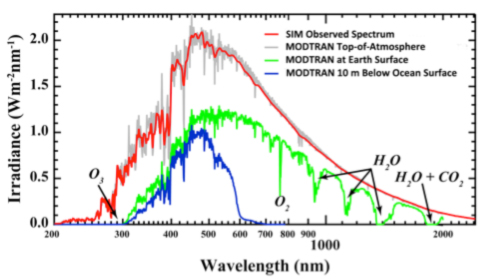 In the 210- to 2400-nm range, SIM collects about 97% of the total solar irradiance, compared with spectral radiometers from earlier eras that typically measured only at wavelengths shorter than 400 nm. Thus, SIM provides a comprehensive view of wavelength contributions to solar irradiance variability. Figure 4 shows the solar spectrum from 210 to 2400 nm measured by SIM (i.e., in orbit), and how that spectrum changes as the radiation encounters the top of Earth’s atmosphere, passes through the atmosphere to the surface, and then passes through 10 m (32.8 ft) of clear ocean water. Figure 4. The solar irradiance spectrum is altered as it passes through Earth’s atmosphere, and further altered by passing through water. The top red curve within the light gray curve is a SIM-observed spectrum, and the others are MODTRAN-generated spectra corresponding to the top of the atmosphere (middle curve), at the surface (equatorial, no cloud cover) and (lowest curve) at 10 m (32.8 ft) below the surface for clear ocean water. Also indicated are absorption bands for the major atmospheric absorbers: ozone, water vapor, and carbon dioxide. Image credit: LASP. SORCE’s Solar Irradiance Comparison Experiment (SOLSTICE). Reference spectra of the solar irradiance under different conditions of solar activity are essential physical quantities for studying solar influences on Earth’s climate system and the atmospheres of Earth and other planets. For example, solar reference spectra are used as input in general circulation models of Earth’s coupled atmosphere–ocean system to study long-term variations, ranging from changes due to the 11-year solar cycle to changes occurring over centuries that can affect global climate change [e.g., Rind et al., 2003]. Solar reference spectra are also useful for establishing and validating models of solar irradiance. These models are essential for times when no solar observations are available, such as between current space-based observations, and for reconstructing solar irradiance at times prior to the space era, such as the Maunder Minimum period during the late seventeenth century. The international Whole Heliosphere Interval (WHI) which occurred from March–April 2008 was an excellent opportunity to coordinate observations with many missions (including SORCE), and to compare results for solar cycle minimum conditions. The WHI campaign focused on the solar Carrington Rotation 2068 (from March 20 to April 16, 2008) and included a quiet Sun campaign from April 10-16, 2008. During this period, the average international (Zurich) sunspot number was very low at only 2, and the average Penticton 10.7-cm radio flux (F10.7) was also very low at 69 (x 10-22 W/m2/Hz). The “minimum” spectrum for the WHI Solar Irradiance Reference Spectra (SIRS) is for this quiet Sun campaign—as shown in Figure 2. The SORCE SIM, SOLSTICE, and XPS instruments provided SSI measurements for WHI SIRS in the wavelength ranges of 0.1 to 6 nm and 115 to 2400 nm [Woods et al., 2009]. The EUV gap was filled with rocket measurements from the prototype Solar Dynamics Observatory (SDO) EUV Variability Experiment (EVE) [Chamberlin et al., 2009]. Changes in the Sun’s irradiance impart an external forcing to Earth’s climate and atmosphere that must be reliably specified over multiple time scales for use in simulations of global change. When IPCC AR4 was conducted, most of the general circulation climate model (GCCM) simulations included only variations in TSI to specify this natural forcing. However, physical models have now advanced, such that state-of-the-art GCCMs use SSI as an input. The most developed of these, the chemistry-climate models (CCMs), also include detailed ozone chemistry. Thus far, model simulations, including the CCMs used for the Ozone Assessment (2011) and those in progress for IPCC AR5, provide SSI variations as inputs, commensurate with those of the NRLSSI model. The recognition that SIM measurements suggest a different scenario to describe solar variability has motivated a number of studies using climate models with alternative SSI variations. Most notably, those derived from the SIM observations imply much larger and differently phased variations than the NRLSSI model. Model estimates with different SSI variability show solar-cycle responses in upper-atmospheric ozone that can be compared with observations [e.g., Harder et al., 2009; Cahalan et al., 2010; Haigh et al., 2010; Merkel et al., 2011]. Studies of this kind are in their infancy, and ultimately require extended and validated solar and atmospheric time series for reliable conclusions. Expanding the comparison to include other key observables, like temperature and the hydroxyl radical (OH–), and analysis of additional solar cycles will lead to a deeper understanding of the complicated role of SSI variability in Earth climate studies. The TIM and SIM both utilize ESRs to measure incident sunlight power with unprecedented on-orbit accuracies and stabilities. These efficient broadband light-absorbing devices are maintained at constant temperature by electrical heaters while incident sunlight is shuttered on and off, providing radiative heating and cooling of the sensors, respectively. This modulated radiant heating must be exactly compensated for by opposing electrical heater power variations to maintain constant radiometer temperature. Precise knowledge of the electrical power to the radiometers enables measurement of the incident sunlight power with high radiometric accuracy. While this classical measurement approach is fundamentally simple, it is nevertheless a challenge to achieve the precision and accuracy needed to unambiguously detect true solar irradiance changes. To advance these measurements, SORCE’s instruments incorporate the following innovative, new technologies, not flown on prior spaceborne radiometers. An absorbing surface of nickel phosphorous, a diffuse black metal with high absorptivity over a broad spectral range, enables very high efficiencies of the instruments’ radiometers while providing high thermal conductivity for improved radiometer response in addition to superior stability against exposure to solar UV and high-energy radiation. Phase-sensitive detection in both on-orbit instrument thermal control and in ground data processing greatly reduces sensitivities to low-frequency thermal drifts and high-frequency noise, improving the instruments’ abilities to detect minuscule solar fluctuations. Apertures calibrated at NIST precisely define the areas over which sunlight is collected. The TIM’s optical design, with a defining aperture at the front of the instrument, allows only entry of light intended for measurement, and reduces internal instrument scatter that causes erroneously high readings in other spaceborne TSI instruments. The SIM’s Fèry prism both focuses and disperses light over a very broad wavelength range with only one optical element to reduce light losses and to improve radiometric accuracy. 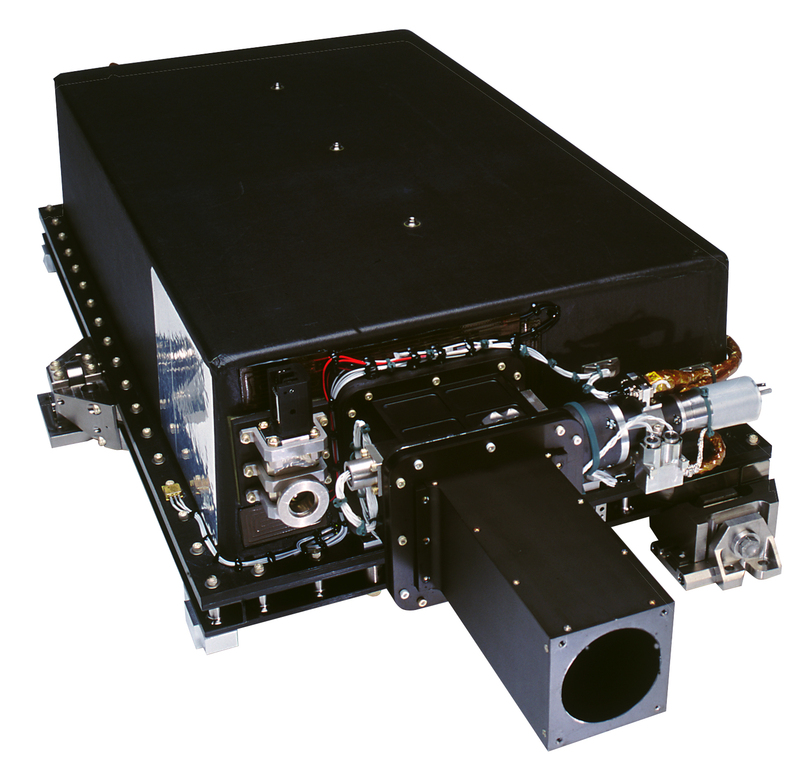 The SIM’s miniaturized ESRs measure signals 1000 times smaller than the TIM’s, using a thermally isolated flat diamond strip bolometer in a reflective hemisphere for high efficiency. The SIM’s linear charge-coupled device at the focal plane determines the spectrometer’s wavelength scale, correcting time-dependent distortions induced by thermal variations, and reducing wavelength-dependent uncertainties affecting the measurements. Having been successfully demonstrated for spaceborne solar irradiance monitoring for the first time by SORCE, these instrument innovations will be carried into future flight programs that require high on-orbit stabilities for climate monitoring, such as the upcoming National Oceanic and Atmospheric Administration (NOAA)’s Total Solar Irradiance Sensor (TSIS) that is to be part of the Joint Polar Satellite System (JPSS). George Lawrence’s Philosophy of Meterology. When you make something 10 times more precise, then there will be 10-squared more corrections to make. The TIM’s electrical substitution radiometer (ESR) has enabled SORCE to measure the solar irradiance with an improvement in precision by more than a factor of 10. One of the most widely used proxies for solar activity is the Magnesium II core-to-wing ratio (Heath and Schlesinger, 1986). It has been measured from space on a daily basis since 1978 from a variety of spacecraft. The majority of these measurements have been made with fairly low resolution spectrometers, usually with a 1.1 nm bandpass. SOLSTICE has continued this record of solar activity with greatly increased (0.1 nm) spectral resolution. Algorithms that seamlessly merge Mg II index measurements from different instruments have produced a single new SORCE composite—see Figure 5. This composite Mg II index is widely used by both the solar and atmosphere communities. Figure 5. 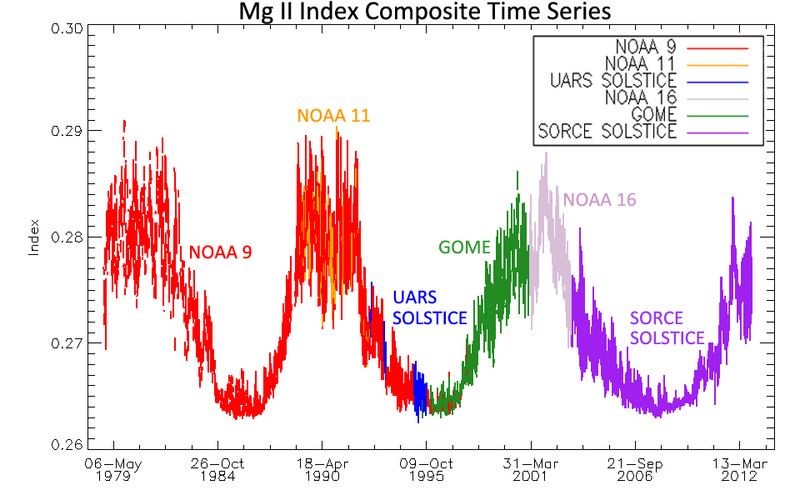 Magnesium II Core-to-Wing Index Composite Time Series. This proxy for solar activity has been continuously measured since 1978 by a variety of instruments operated by both NOAA and NASA. SORCE SOLSTICE has been making daily measurements since its launch in 2003. Image credit: LASP. "SORCE has set a new standard of accuracy, precision, and wavelength range for the Sun’s irradiance, a kind of ‘climate gold standard’ for the radiative forcing of Earth over the decade of the 2000’s, beginning with the dramatic Halloween flares of October-November 2003, through the historically low 2008–2009 minimum of Solar Cycle 23, into the rise of Solar Cycle 24, providing a climate record likely to grow in value for Sun and Earth studies over many decades to come." Figure 6. SORCE TIM TSI observation of the large solar flare on October 28, 2003. The GOES X-ray time series (green line) are used to fit the TSI time series with an additional linear background trend (red line). The SORCE XPS 0.1 to 27 nm data (blue line) are also shown. This figure is adopted from Woods et al. (2006). Flare observations in the TSI record have been elusive prior to SORCE, but the improved measurement precision by the SORCE instruments has enabled new discoveries about flare energetics. SORCE TIM made the first detection of flares in the TSI—see Figure 6. 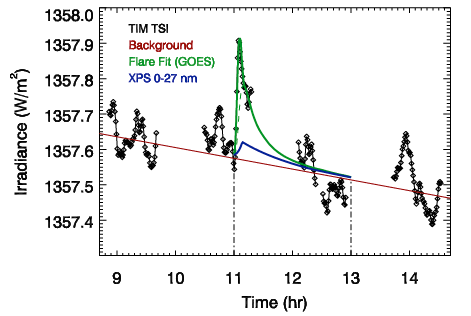 These TIM flare observations indicate a total flare energy that is about 100 times more than the X-ray flare measurements in the 0.1 to 0.8 nm range [Woods et al., 2006]. SORCE’s XUV Photometer System (XPS). This result is surprising because it is a factor of 10 more than previously expected based on X-ray and ultraviolet measurements only [Hudson and Willson, 1983; Hudson, 1991]. In addition, the SORCE SSI measurements show that the ultraviolet irradiance increases during flares account for 50% or more of the flare variations seen in the TSI, with most of this contribution coming from the ultraviolet shortward of 140 nm. The remaining part of the flare energy is assumed to come from wavelengths longward of 200 nm, typically only needing about 100 ppm increase for the largest flares. Some of SORCE’s key flare results are provided by Woods et al. (2004, 2006, 2008). Figure 7. The TIM TSI data can be modeled accurately with dark sunspot and bright faculae contributions. The Sun’s activity produces features in the solar atmosphere that alter the net brightness of the entire disk because the emission in these local regions differs from that of the quiet background solar atmosphere. Dark sunspots present on the hemisphere of the Sun facing the Earth reduce the TSI by as much as 0.4%. Resultant dips in total irradiance are a key visual feature in the record of TSI. Other magnetic features, called faculae, are bright and more dispersed over the disk, and increase the total irradiance slightly. Thus the Sun’s irradiance varies continuously in response to the two competing effects of dark sunspots and bright faculae. 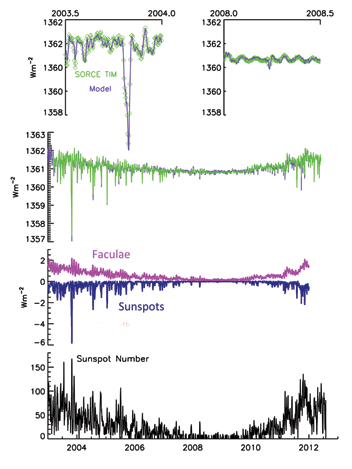 A model that combines the series of sunspot blocking and facular brightening closely tracks the TIM observations —see Figure 7—and enables extension of the irradiance record beyond the SORCE mission. Sunspots and faculae alter the Sun’s emission at all wavelengths. Before SORCE, estimates of how the Sun’s visible and near-infrared spectrum might vary relied on models, such as the Naval Research Laboratory Solar Spectral Irradiance (NRLSSI) model (e.g., Lean, 2000). The wavelength-dependent fluctuations that occur on time scales of active region evolution and the Sun’s rotation – days to months – modeled by NRLSSI closely track the variations that SORCE measures from 120 to 2000 nm. In addition, the Solar Irradiance Physical Modeling (SRPM) was developed to further investigate sources of solar irradiance variability. 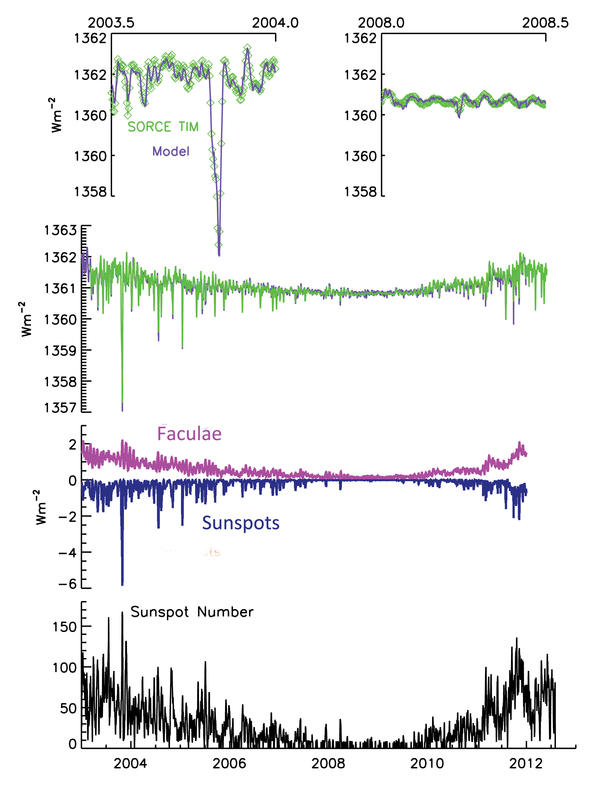 Figure 8 shows the time series at two wavelengths extracted from daily solar irradiance spectra constructed from a set of seven physical models of solar features and non-local thermodynamic equilibrium (non-LTE) calculations of their emitted spectra as function of solar view angle (i.e., the center-to-limb contribution), using solar images from the Precision Solar Photometric Telescopes (PSPT) to specify the distribution of features on the disk. Improved understanding of and correction for the time-dependent changes in the sensitivity of the SIM and SOLSTICE instruments is crucial for advancing knowledge of SSI variations. Toward that end, the SORCE science team is conducting a series of focus workshops on instrument calibration, in-flight performance, and measurement validation. Figure 8. For Solar Irradiance Physical Modeling (SRPM), images from the Precision Solar Photometric Telescope (PSPT) are combined and used to produce a mask image of the seven solar features. The model atmosphere for each feature and their location on the disk are used to compute the emergent intensity using a full non-local thermodynamic equilibrium (LTE) radiative transfer code. The model output is compared to SIM at two wavelengths [right]. PSPT Images from the Mauna Loa Solar Observatory and the Rome Observatory are both used for SRPM input. 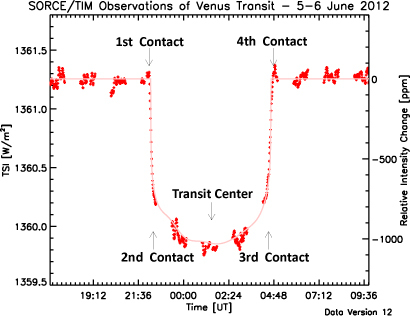 The TIM has observed the transits of both Venus (June 2004 and June 2012) and Mercury (May 2003 and November 2006). Fortunate indeed, as the next transit of Venus won’t occur until 2117. Mercury transits are more frequent with the next in 2016 and a second to follow in 2019. The transits of these innermost planets, being much smaller than the solar disk, cause correspondingly small decreases in the Sun’s brightness. Figure 9. The June 2012 transit of Venus across the Sun [left] shows the decrease in total solar brightness, analogous to that caused by exo-solar planets transiting their parent stars [right]. Image Credit: [right] from Nature, 470, 53–58, 3 February 2011]. The June 5-6, 2012 Venus transit, as with the 2004 transit, is unmistakable in the TIM measurements—indicated by the dots in Figure 9. In excellent agreement with predictions (solid faint curve) based on the positions of SORCE, Venus, and the Sun, and including solar limb darkening, the net sunlight decreased by 0.1% during this most recent transit—making it decreasing brightness nearer the transit midpoint is due to the Sun being brighter near disk center than at the edges, so Venus blocks more light when nearer disk center. The small fluctuations in solar brightness on short time scales are from solar convection and oscillations, and can be seen in measurements both before and after the transit. Gaps in the plotted data are from periods when the SORCE spacecraft was eclipsed by the Earth and could not view the Sun. Exo-solar planets are being discovered via transits in front of their stars using similar photometric measurements. While Venus causes a 0.1% decrease when transiting the Sun as viewed from the Earth’s relatively close vantage point, if seen from another star system this transit would appear as a mere 0.008% decrease. Superposed on that signal are comparable stellar fluctuations of ~0.005% from which the transit must be distinguished; such are the difficulties that are being overcome by exo-solar planet discovery experiments such as NASA’s Kepler mission. "As we approach the tenth anniversary of the launch, I reflect on the more than 25 years the program has been ongoing. The success created by the true teaming of the university, government, and industry that delivered this mission within budget, on time, and fully successful in meeting the science requirements is a tremendous source of pride for myself and the more than 500 people who have been involved. I hope that this success will provide a beacon for PI-mode missions and demonstrate a way to achieve success for future missions." The preflight preparation for the SOLSTICE instrument included an end-to-end calibration at NIST’s Synchrotron Ultraviolet Radiation Facility. The absolute responsivity of the instrument was measured for both solar and stellar modes to an accuracy of better than 3%. This pre-flight calibration was performed as part of the primary science requirement for the instrument, but it also had the additional benefit of allowing the measurement of the absolute stellar spectral irradiance for target stars. The SOLSTICE instrument uses observations of a set of bright, blue stars to track changes in the instrument over time, and during the course of the SORCE mission, there are many observations of these stars. In contrast, the ultraviolet instruments used by the astronomy community are not calibrated using an absolute source before flight. Instead, they have relied upon theoretical models of the outer atmospheres of white dwarf stars to estimate the responsivity of their instruments [Bohlin et al., 2011]. The SOLSTICE stellar observations have allowed, for the first time, this white dwarf flux scale to be compared to observations from an instrument calibrated at a primary standard source [Snow et al., 2012a]. SOLSTICE has also made routine observations of the Moon. The design of the SOLSTICE instrument allows observations over a large dynamic range and can easily provide the lunar spectral irradiance. Since the same instrument also observes the incident SSI, the ultraviolet lunar reflectance can be determined with minimal calibration uncertainty. The orbital geometry of SORCE allows observations of the Moon at nearly all phase angles. Knowledge of the lunar reflectance not only provides clues about the space weathering processes on the lunar surface, it also allows the Moon to be used as a calibration target for other planetary and Earth-observing missions [Snow et al., 2012b]. 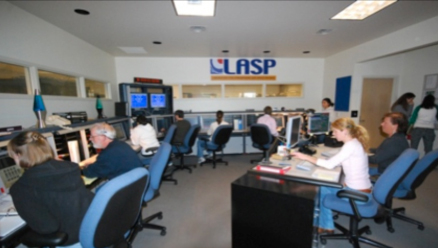 SORCE operations personnel working in the LASP Mission Operations Center. Image credit: LASP. SORCE’s instruments and spacecraft components have performed exceptionally well during its first ten years on-orbit, and remain very healthy overall. The exception is the spacecraft battery, with aging that will eventually limit SORCE’s life. Already the instruments take a “power nap” during the night side of each orbit; there are very few other options to further reduce battery loads. 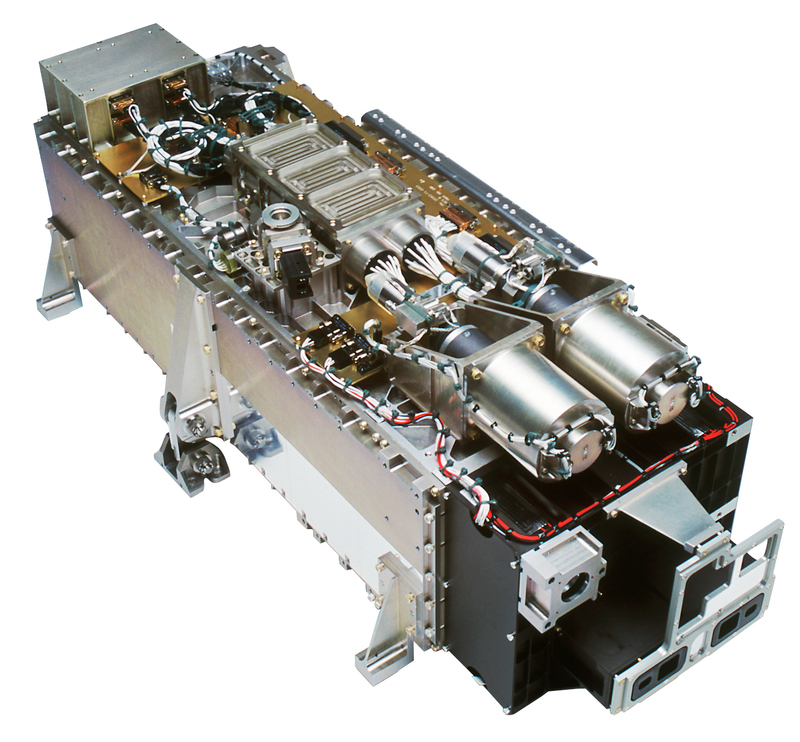 SORCE could potentially operate in this reduced power mode for years, but eventually the spacecraft power system will brown out and shut down critical spacecraft subsystems. With no on-board propulsion, SORCE will slowly descend due to atmospheric drag and reenter Earth’s atmosphere sometime in the next decade. The solar irradiance record will continue after the SORCE mission ends. LASP has been preparing the next generation TIM and SIM instruments. The TIM’s second space flight opportunity was abruptly terminated when NASA’s Glory mission failed during launch on March 4, 2011. The TIM’s next flight opportunity is NOAA’s TSI Calibration Transfer Experiment (TCTE), with launch aboard the Air Force STPSat-3 planned for August 2013. Advanced versions of TIM and SIM instruments have been built and are currently in calibration at LASP for NOAA’s Joint Polar Satellite System (JPSS) program, with a first launch planned for 2016. Should SORCE end before the launch of these follow-on missions, the quality of the extant solar irradiance record will degrade significantly, since maintaining the record’s long-term repeatability requires overlapping sets of measurements. Every effort is being made to keep SORCE operating for as long as possible while exploring early flight options for NOAA’s TIM and SIM instruments. The SORCE mission has exceeded expectations in precisely and accurately measuring TSI and SSI for ten years—five more years than planned—and over a unique solar cycle. After an unusually extended period of inactivity from 2007 to 2009, Solar Cycle 24 came to life. SORCE is observing the current solar cycle maximum, which has only half the vigor of previous cycles that occurred during the space age. The Sun is offering new opportunities to study—and perhaps even to challenge—our understanding of how Earth’s atmosphere and climate responds to different levels of solar activity. It is fortunate that SORCE is there to record these solar cycle changes. SORCE’s very successful mission is the product of spectacular engineering, mission operations, and management teams at LASP, OSC, and GSFC. The SORCE science team and broader international Sun and Earth communities have contributed to the remarkable science results from the mission. To commemorate SORCE’s observations over one complete 11-year solar cycle, the next SORCE Science Team Meeting is being planned for January 2014 (SORCE’s eleventh birthday—that is, one complete solar cycle) with focus topics concerning the key results during the mission. 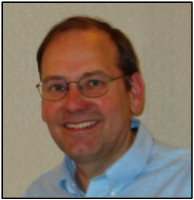 SORCE’s roots originate in an EOS proposal written in 1988 with Gary Rottman [LASP—Former Principal Investigator (PI)], Tom Woods [LASP—Instrument Scientist and Current PI], and Tom Sparn [LASP—Program Manager]. Dozens of different missions were considered in the early days of this program, all led unwaveringly by Sparn. The SORCE mission finally crystallized into a PI-led mission in 1999 and quickly accelerated from concept to reality with partners at GSFC and OSC. Launched on January 25, 2003, the SORCE mission has since exceeded all science objectives and our own personal expectations. 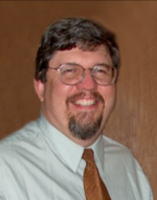 As is common with long-term programs, there were some retirements along the way, notably TIM and ESR wizard George Lawrence [LASP] in 2003, PI Gary Rottman in 2005 (with Tom Woods then taking on the PI position), and Ed Chang [GSFC—SORCE Project Manager] in 2010. 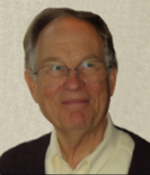 Unfortunately we also suffered the loss of our dear friend and SORCE Co-Investigator, Julius London [University of Colorado, Boulder] in 2009. The energy and dedication of the many SORCE team members at LASP, OSC, GSFC, and NRL have made being a member of this team a great pleasure. The goals of significantly advancing the accuracy and precision of TSI and SSI measurements were always at the forefront of any discussion about the SORCE mission, and that scientists and engineers alike shared this attitude is possibly the key ingredient for SORCE’s exceptional success. We are very grateful to all of the SORCE team members for providing outstanding scientific results and new engineering capabilities for irradiance instrumentation and spacecraft technology. We feel privileged that the SORCE mission transpired during exciting times on the Sun, with the extremely large solar storms in October-November 2003, an unusually long solar cycle minimum in 2008-2009, and interestingly low cycle maximum in 2011-2012. We are especially proud that SORCE has been able to contribute 10 years of data to the irradiance climate record that spans more than 30 years for some wavelengths. We also like to think that the late Jack Eddy would be equally as proud of SORCE’s continuation of the solar irradiance climate record. Bohlin, R. C., K. D. Gordon, G. H. Rieke, et al. (2011), Absolute flux calibration of the IRAC instrument on the Spitzer Space Telescope using Hubble Space Telescope flux standards, The Astronomical Journal, 141, 173. Cahalan, R. F., G. Wen, P. Pilewskie, and J. 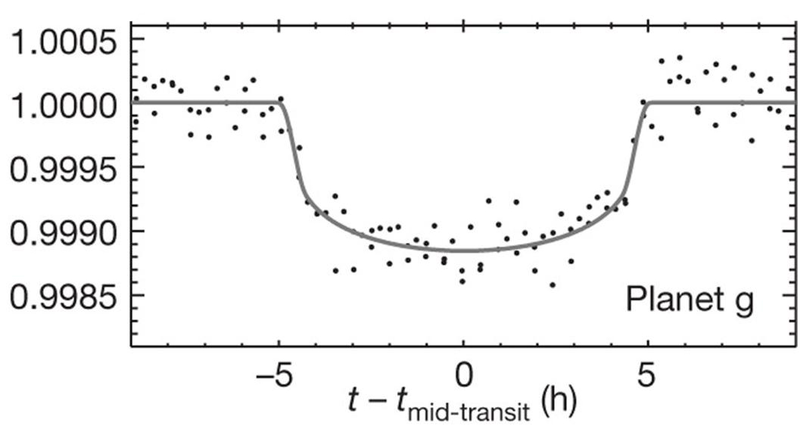 Harder (2010), Temperature Responses to Spectral Solar Variability on Decadal Timescales, Geophys. Res. Lett., 37, L07705. Chamberlin, P. C., T. N. Woods, D. A. Crotser, F. G. Eparvier, R. A. Hock, and D. N. Woodraska (2009), New, Higher Resolution Solar Extreme Ultraviolet (EUV) Irradiance Results for Solar Cycle Minimum Conditions on April 14, 2008, Geophys. Res. Lett., 36, L05102. Haigh, J. D., et al. (2010), An influence of solar spectral variations on radiative forcing of climate, Nature, 467, 696. 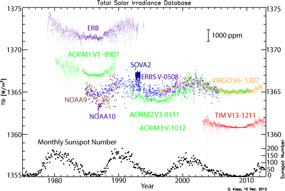 Harder, Jerald W., J. M. Fontenla, P. Pilewskie, E. C. Richard, and T. N. Woods (2009), Trends in solar spectral irradiance variability in the visible and infrared, Geophys. Res. Lett., 36, L07801. Heath, D. F. and B. M. Schlesinger (1986), The Mg 280-nm doublet as a monitor of changes in solar ultraviolet irradiance, J. Geophys. Res., 91, 8672. Hudson, H. S. (1991), Solar flares, microflares, nanoflares, and coronal heating, Solar Phys., 133, 357. Hudson, H. S., and R. C. Willson (1983), Upper limits on the total radiant energy of solar flares, Solar Phys., 86, 123. Intergovernmental Panel on Climate Change, Fourth Assessment Report (2007), The Physical Science Basis, eds. S. Solomon et al., Cambridge University Press. Kopp, G. and J. L. Lean (2011), A new, lower value of total solar irradiance: Evidence and climate significance, Geophys. Res. Lett., 38, L01706. Lean, J., (2000), Evolution of the Sun’s Spectral Irradiance since the Maunder Minimum, Geophys. Res. Lett., 27, 2425. Merkel, A. W., J. W. Harder, D. R. Marsh, A. K. Smith, J. M Fontenla, and T. N. Woods (2011) The impact of solar spectral irradiance variability on middle atmospheric ozone, Geophys. Res. Lett., 38, L13802. Rind, D., D. Shindell, J. Perlwitz, J. Lerner, P. Lonergan, J. Lean, and C. McLinden (2003), The relative importance of solar and anthropogenic forcing of climate change between the Maunder Minimum and the present, J. Climate, 17, 906. Snow, M., A. Reberac, E. Quémerais, J. Clarke, W. E. McClintock, and T. N. Woods (2012a), A new catalog of ultraviolet stellar spectra for calibration, in Cross-calibration of Far UV Spectra of Solar System Objects and the Heliosphere, ISSI Scientific Report No. 13, E. Quémerais, M. Snow, and R. M. Bonnet eds., Springer, New York, 197, in press. Snow, M., G. Holsclaw, W. E. McClintock, and T. N. Woods (2012b), Absolute ultraviolet irradiance of the Moon from the LASP Lunar Albedo and Analysis from SOLSTICE (LLAMAS) project, in Cross-calibration of Far UV Spectra of Solar System Objects and the Heliosphere, ISSI Scientific Report No. 13, E. Quémerais, M. Snow, and R. M. Bonnet eds., Springer, New York, 243, in press. Woods, T. N., F. G. Eparvier, J. Fontenla, J. Harder, G. Kopp, W. E. McClintock, G. Rottman, B. Smiley, and M. Snow (2004), Solar irradiance variability during the October 2003 solar storm period, Geophys. Res. Lett., 31, L10802. Woods, T. N., G. Kopp, and P. C. Chamberlin (2006), Contributions of the solar ultraviolet irradiance to the total solar irradiance during large flares, J. Geophys. Res., 111, A10S14. Woods, T. N., P. C. Chamberlin, W. K. Peterson, R. R. Meier, P. G. Richards, D. J. Strickland, G. Lu, L. Qian, S. C. Solomon, B. A. Iijima, A. J. Mannucci, and B. T. Tsurutani (2008), XUV Photometer System (XPS): Improved irradiance algorithm using CHIANTI spectral models, Solar Phys., 250, 235. Woods, T. N., P. C. Chamberlin, J. W. Harder, R. A. Hock, M. Snow, F. G. Eparvier, J. Fontenla, W. E. McClintock, and E. C. Richard (2009), Solar Irradiance Reference Spectra (SIRS) for the 2008 Whole Heliosphere Interval (WHI), Geophys. Res. Lett., 36, L01101. 1. The total solar irradiance, or TSI, is defined as the solar energy per unit time over a unit area perpendicular to the Sun’s rays at the top of Earth’s atmosphere.